An engaging game that is simple to learn, challenging to master, and far more addictive than you'd expect. The challenges mode is quickly finished, and the overall story to the game seems a bit of an unnecessary afterthought. For board game aficionados, the hardest part can often be that there isn’t someone else available when you are jonesin’ for a game. After all, you can’t really play a board game on your own. 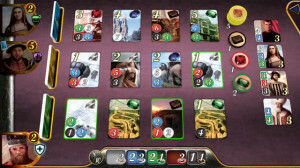 Having an opponent at the ready at any time or place is a definite advantage of digital games – not to mention the fact that your board is always ready, whether you’re relaxing at home or suffering through a long commute. Of course, computer opponents don’t always stand up to the test, so having the option to play with real people is a plus as well. It takes many different aspects to successfully adapt a board game to handy mobile form, and it isn’t always done well. 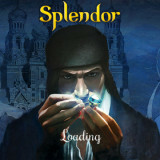 Splendor is a best selling game that taps into the competitive spirit of gamers rather well. The game is incredibly strategic when playing against a single opponent, but there is much less opportunity for strategy (and more opportunity for luck to come into play) when playing with three or four opponents. 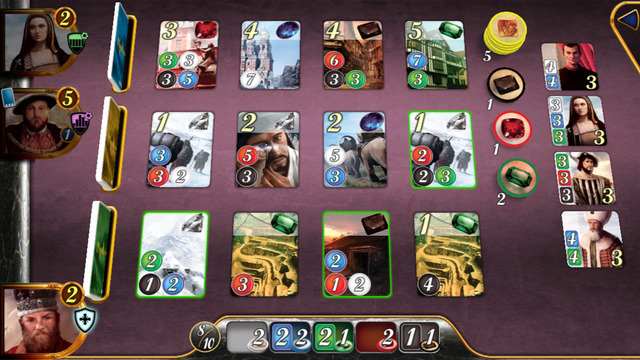 The mobile adaptation duplicates this well, as you can play against a single computer opponent, up to three computer opponents, or switch to pass and play mode for up to four local players. The goal of the game is to be the first player to reach fifteen prestige points – a task that can be quite challenging, making for a very competitive match. The rules of the game are quite simple to learn, and a quick tutorial walks you through them before you begin play. There are three rows of cards, in increasing “prices”. These cards can be purchased using the gems shown as their purchase price. Purchasing a card will get you a bonus gem that stays in your hand always, prestige points, or both. For each turn, you have a choice between four actions: pick up three gems of different colors, pick up two gems of the same color, purchase a card, or reserve a card (this allows you to set aside a card for later purchase, and also gets you a wild card gold gem). 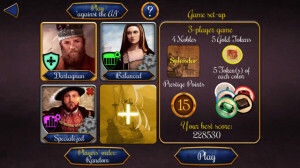 That is pretty much the gist of the game – you and your opponents amass gems, purchase cards, and race to fifteen points. All of that is pretty easy to pick up, but there are a few caveats that keep things interesting. You can hold no more than ten gems in your hand at a time (excluding bonuses), which means a lot of the more expensive cards can only be purchased if you have bonuses. This really gets to the strategy of the game. Do you save up your gems to buy the cards you want as soon as possible, or buy cheaper cards right away to build up your bonuses? It’s all in your style of play, and what you choose may be affected by who you are playing against. 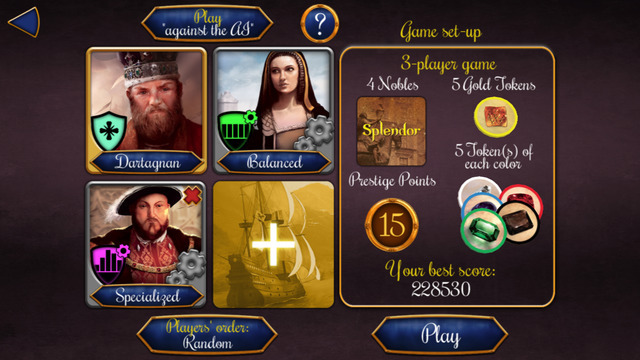 When you select a computer opponent, you can also select from different styles of play, such as balanced, opportunistic, and secretive. On top of that, you and your opponents will vie for noble cards. These give you a specified amount of prestige points, once you reach a certain arrangement of bonus gems. The plus with these cards is that you essentially get them for free, and they provide a nice boost to your score. The board game is the meat of the game, but there is also a challenge mode for those of us who like variety. In this mode, you are the only player – no opponents. You are given a little scenario for motivation, but much like the story of the game, the story here really doesn’t add much to the action. The challenge is in achieving a certain goal within set parameters. 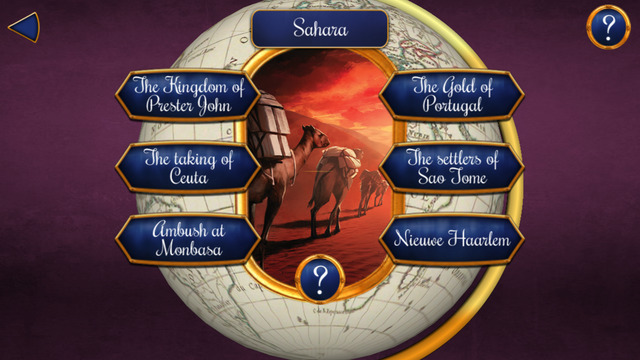 These generally involve reaching a certain number of prestige points within a set number of turns. The catch here is that each challenge has its own rules. You may be given bonuses to start with, or be allowed to pick up four gems at a time, and often times the number of prestige points you need to reach increases the longer you play. They do make for a nice challenge, but they are quickly finished. I would have liked to see a bit more of these, or some sort of randomization to make them more interesting to replay. Still, they do add to the game, and are fun for the short time they last. 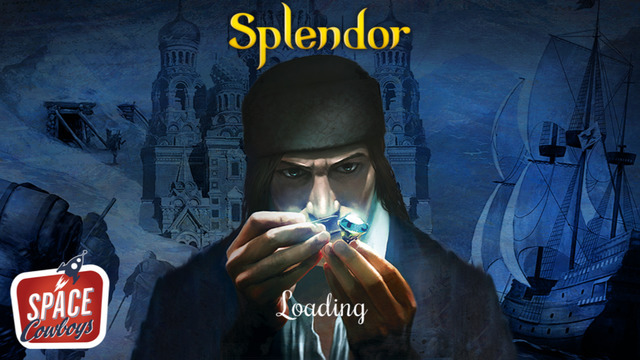 Splendor is one of those games that doesn’t seem like much when you first play it. But once you get caught up in the nuances of the game, you’ll be hooked. It has an easy to understand mechanic that makes getting into the game simple, yet challenging at the same time. It’s a great choice for board game aficionados, and anyone who is looking for something a little bit different.